Yes, I'll Take Some Oregano! Aish and I were in the mood for Italian, specifically pizza. My family has gone to Vezzo (http://www.vezzothincrust.com/index.html and had rave reviews. I knew it was thin-crust. Sometimes I'm on the fence with thin-crust. Especially when it is priced the same as New York Style pizza. Since there is less bread, it is much less filling. Also, if you like toppings on your pizza (like most people) the thin-crust does not support much weight. Anyway, onto my experience at Vezzo! I've been drinking more beer lately and I was craving a Peroni. I noticed that it was on draft, so I was excited! My server informed us that the draft system wasn't working, so I opted for a Pacifico. I noticed Sweet Italian Sausage was an option for a topping, so I went for that and fresh basil. The level of basil was a little overwhelming and seemed like a salad instead of a topping since it wasn't wilted down. Aish got the vegetarian pizza (Giardino). The weight of all the vegetables didn't stand a chance to the thin crust. Also, there were full pieces of roasted garlic. Aish commented that it was a bit intense. Chopped up garlic would likely be better and more enjoyable. The size of the toppings were just too huge for such a thin pizza. I don't think I'll be coming back here. The pricing is the same as pizza places I prefer with thicker crusts (like Garlic) that are more filling. It is more of a personal preference. When organizing a celebratory dinner, I keep in mind all attendees: specifically food preferences and desired atmosphere (quiet, hip & trendy or well-lit). My entire family enjoys Italian food, so I put a lot of effort into finding a place that would make everyone happy...or so I thought! I chose Trattoria il Mulino (http://www.trattoriailmulino.com/trattoria-il-mulino-new-york-menu/) thinking it would please everyone and it ending up disappointing everyone instead. Let me take you through the meal so you understand. Several days before our reservation (through Open Table), I called the restaurant directly. I requested that we be given a seat that would be easier for a handicapped person to sit in and be in a quieter part of the restaurant. 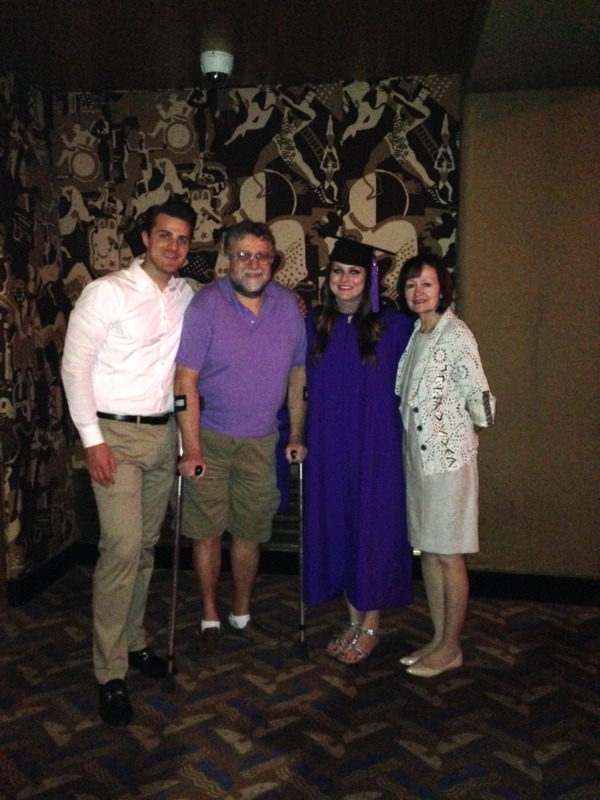 I also mentioned that it was a graduation celebration meal (I also put that in my notes on my reservation). When my mom and I arrived (ahead of my brother and dad, who had to take a cab), I spoke to the host. There were NO NOTES (!!!!) with my reservation. When I asked about the seating, they had no idea what I was speaking about. I asked if we could sit in the booths (easier for my dad to sit in than the chairs there), the host shared that a sporting event would be shown via projectors. I was very disappointed at this point - knowing that my parents would pay several hundred dollars for a meal at a place that 1. had no idea what was going on and 2. was showing a sporting event. I thought this was a much nicer restaurant. At that point, I almost left, which I should of, but I didn't want to make it more difficult for my dad to go to a new location. Coulda, woulda shoulda - next time I need to trust my gut! Once we were seated, we got the complimentary set-up of roasted eggplant (served cold), fresh baked bread and sliced salami. I enjoyed these while I was eating them. Once I got home, I didn't feel that well - potentially from the food. It could have been from the eggplant - eek. I would think this "more affordable" sister restaurant of Il Mulino would have food that far exceeds its cocktails. At least my cocktails kept me distracted from my disappointing experience. I loved the drinks I got. The first one (couldn't find names of cocktails on the website), featured gin and grapefruit juice. I ordered one of the special appetizers - the soft shelled crab. It was far better than my entrée and served with garlic spinach. My dad got the Ricotta Meatballs appetizer. If anything, this restaurant has great décor and the lighting is really nice - I love the fixtures on the ceiling. My mom ordered the Veal Picatta - I tried a piece and it was nice. When I made the reservation, I didn't realize this was the type of restaurant that didn't offer sides with the entrée. So, now a $30 entrée becomes $40 if you add a $10 side (spinach, pasta, etc.). My mom opted not to get any sides. My dad ordered the Gnocchi with Bolognese sauce. He loves this dish and didn't enjoy it. I got the impression that the gnocchi he gets in blister-packs from Costco is better. I didn't take a photo of my brother's swordfish. The portion was embarrassing - especially for $38. It looked like they took a thick filet and cut it in half horizontally. I've never seen swordfish served that thin - maybe on sushi! I ordered the Spaghettini with Meatballs. This place is famous for its Ricotta Meatballs. My dad commented that he felt like they came from some meatball factory since they were so perfectly round - they seemed more like they were made from a machine and not a person. I do enjoy the rougher, homemade touch. I ordered one final cocktail - a Cosmopolitan. It was delicious. I am generally very happy with restaurants that I research and visit. I was so disappointed with this one! I'd also note that the service was subpar - it was hard to get our server's attention when she was busy texting all evening off to the side. What was supposed to be a delightful meal to celebrate my graduation ended up being a real bummer. I'd recommend visiting other Italian spots, like Malatesta Trattoria or Pepe Giallo, the food is much better and much more affordable! One of my block 3 mates, Lilian, thought of organizing a lunch for some of us during Senior Week. She had the great idea and I contributed by thinking of a place to eat on the West Side (we were going to the Frying Pan after). I ended up on Bottino (http://www.bottinonyc.com/). Check out the open-but-enclosed seating area. We had a lovely corner table. You can enjoy the outdoors without being outdoors! I was intrigued by a cocktail on the menu, so I absolutely had to order it! The Grey Gardens Martini is made with Organic Black Tea and Grey Goose, St. Germain, Preserved Lemon Syrup and Honey. This was a fantastic cocktail! If you come, you MUST get it! There were so many options on the menu, I struggled with what to order. Luckily, Jillian and I were interested in the same two entrees, so we split them. Problem solved! Each dish was very different and I'm glad we split them. Initially, I was a bit scared of the boar sausage but it was delicious! The lasagna was also so great - much heavier than the pasta but very tasty. Lilian also got the Orecchiette. Kate got the Sautéed Shrimp with Lentils and Garlic, White Wine and Herbs. After we finished our meal, we ordered a coffee and got dessert. Jillian and I got the Warm Tuscan Bread Pudding, Kate got the Pecan Tart and Lilian got something with Biscotti...I believe Affogato. Usually I LOVE bread pudding, but this one was a bit too custardy. The custard was very eggy and almost looked scrambled, so it was a bit of a bummer. I'd recommend getting a different dessert if you go! I love spending time with Aish - we met in a class we had together last semester with our mutual friend Michelle. We all caught up briefly at beer blast (the weekly happy hour Stern hosts in the building basement) and then Aish & I headed to dinner. I am currently reading a great book (Crazy Rich Asians by Kevin Kwan) and two of the main characters are professors at NYU! In the book, they were set up by a mutual friend and had their first date at La Lanterna di Vittorio (http://lalanternacaffe.com/), an Italian restaurant with an enclosed garden right near campus. I am a huge fan of reading (especially guilty pleasure books such as this one) and even a bigger fan of exploring new restaurants - I knew I had to check this spot out! We each ordered a glass of red wine: the Carmenere Cab. It was delicious and under $10. For our pizza, we ordered the Pizza con Cipolla e Caprino (topped with goat cheese, caramelized onions, walnuts and extra virgin olive oil). Do not be deceived - those slices that LOOK like sausage are caramelized onion! The pizza was super delicious EVEN without meat! It was thin-crust and made to order. I'm glad we split it so we could try two different items. See that truffle goodness? Are you drooling yet? The lasagna was delicious! I took a bite and burned my mouth off - so be cautioned food is served HOT here. Also, I didn't realize this had no tomato in it so when compared to the pizza dish, there wasn't much contrast (cheese vs. more cheese). Next time, I would order the pesto one or meat sauce (damn vegetarians! hehe). The garden were we sat is beautiful - the rest of the dining space seems a bit dark/cramped, so the outside area is wonderful. I highly recommend this spot: the prices are right (most pizzas are $12-$14 depending on toppings) and the ambiance is awesome. After drinks at Whitehall, some of us continued the celebrating and headed to The Meatball Shop (http://themeatballshop.com/locations/#64-greenwich) for dinner. I LOVE THIS PLACE! Especially for late night dining. My favorite "balls" are the spicy pork! I ordered them as the "Naked Balls" with the spicy meat sauce and a side of Parmesan cream sauce. I feel that the combo of the meat and cream sauce is the ultimate! I chose to get them served over rigatoni. This is an awesome spot with great priced food, awesome drinks and incredible special features each day. There are multiple locations in the city, so there is likely a place close to you regardless of location! I got to catch up with one of my favorites, Aish, last week! We've both been bogged down by school and we haven't been able to catch up. What better way to spend time together than over glasses of red wine and yummy Italian food? Otto Enoteca Pizzeria (http://www.ottopizzeria.com/restaurant.cfm) is right near campus, so it was the perfect place to go to! 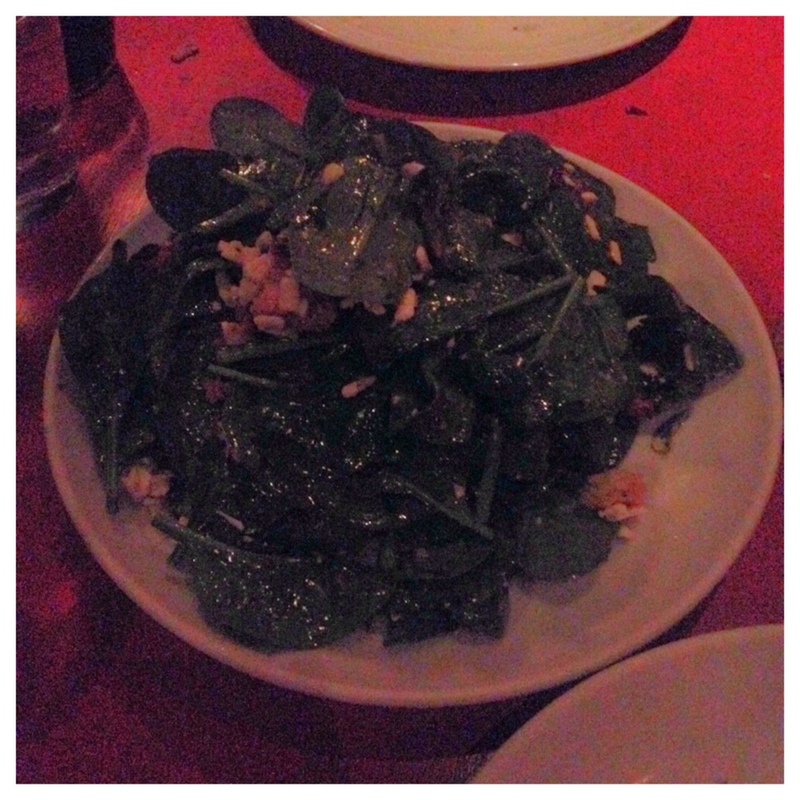 We split the Baby Spinach, Ricotta Salata and Truffle Honey salad. It was delicious! If anything, it may have been a bit overdressed, but it was very tasty. I ordered my favorite pasta from Otto, the Carbonara. It was tasty but not as much as I remembered. Aish ordered the pizza and she was pleased with it. This is a really fun, casual Italian spot. It is low key and the quality far exceeds the price points. Visiting New York Vintners for a Lovely Weekend! Last week, I went with a group of Sternies to New York Vintners (http://www.newyorkvintners.com/) for a night of pizza "making" and wine. The reason I used the quotes is because I was much more focused on appreciating the fine wines we were offered (featured below) than getting my hands dirty. I loved both of the reds, the sparkling and the first white wine. The Chardonnay didn't do it for me. Some of the attendees got in on the action. I am typically all about this type of activity. I love cooking! That night, I took a back seat because I wanted to relax and catch up with some of my friends that were there (Katharine and her lovely boyfriend, Dan, for example). The ingredients! Cheese, chicken, veggies and more CHEESE! We had a variety of pizzas made! My favorite was the confit chicken with Boursin cheese. It was DELICIOUS! I had more than one slice for sure - oops! The other ones offered were roasted veggie and roasted pork with blue cheese and bbq sauce. The veggie one was nice. The pork one was ok - the pieces were a bit huge and unwieldy to eat. Smaller pieces of meat would have been a lot better. My main criticism would be no dessert. I am a sweets gal and would have loved a dessert pizza! This would have been a nice touch. While people were making pizza, I saw cookie dough. I was silly to think it was for us. It was merely a tease for another event. Not cool! In New York City (and in cities across the country), Restaurant Week is a magical time. Not only do you get to visit many restaurants that may be outside of your price range for $25 for lunch and $38 for dinner, the week breaks rules of the universe. The "week" lasts from February 17th to March 7th - amazing! Also, if you have an American Express card and register it to save $5 for EACH Restaurant Week transaction (https://enroll.amexnetwork.com/US/en/winternycrw2014/). I'm a big fan of the Top Chef franchise and winner of the first season, Harold Dieterle - this is his third venture in NYC (also owns Perilla and Kin Shop). The Marrow has German and Italian influences. The menu for Restaurant Week is key - even if the spot you're going to is well-known for certain dishes, make sure some of them are on the reduced-price menu! Otherwise, what is the point of visiting it? We arrived a bit earlier and each ordered a cocktail at the bar. I got the Eye of the Tiger, made with Cognac, 7 year old rum, vanilla and cinnamon. The cocktail had a wonderful profile; I loved the touch of the single massive ice cube too! Aish ordered the Miss Roberts' Cobbler, made with Owney's Rum, Pear Jam, Lavender and Thyme. She loved it so I had to try a sip - it was tasty! Once our table was ready, we were seated and given the menu. We already looked it over before we came so we knew exactly what to order! We did noticed that the menu featured three bottles of wine for $38! We ordered the Red, the Pittnaur Velvet 2008 from Burgenland, Austria. I'm glad we split this - for about 2.5 glasses each, that is a great bargain. While we waited for our entrees, we were served a freshly baked (and HOT!) pretzel style roll with mustard and oil. Spicy mustard and olive oil complement the bread! Just as we were finishing up our rolls, we were served our first course. We both ordered the Roasted Sunchoke Soup topped with toasted sunflower seeds and snipped chives. The soup came out PIPING HOT! After it cooled down for a hot second (no pun intended), we enjoyed each and every spoonful. The soup had a velvety texture and was utter perfection. For my entrée, I ordered the Sautéed Skate Wing, served with Black Forest Ham, Cabbage and Warm Mustard Sauce. I'm a huge fan of Skate, so I was excited to try it. The German-style prep on the Skate was different and incredibly tasty. I was very happy with my order! Aish, the vegetarian that she is, ordered the Housemade Pappardelle served with braised forest mushrooms, lemon thyme and pecorino. She really liked it, or at least I assume she did, since she inhaled it. This is why we're such good friends! For the desserts, I ordered the Spiced Streusel Kuchen, served with roasted apples and caramel ice cream. This dessert was delicious!! Aish wanted no part of it since she isn't a big fan of apples - weirdo! Just kidding. She went with the other option, the Milk Chocolate Panna Cotta, served with grape jam and peanut biscotti. I much prefer dark chocolate to milk, but Aish loved it. I was happy for her. She avoided the apples, so she was a happy camper. When we were given the check, we were presented with MORE food. Two gingersnap style cookies - so great. I was very happy with the overall experience. I look forward to coming back here to order some other menu items, especially the Pan-Fried Duck Schnitzel! Malatesta Trattoria For the Win! I recently posted about Otto, an Italian place near school. This post spurred a bunch of helpful recommendations from my friends for other favorite Italian spots. My friend Nikki suggested a spot in the West Village, Malatesta (no website; http://www.yelp.com/biz/malatesta-trattoria-new-york). I put it on my list of places to try out. Coincidentally, I was going out with my friend Aish for dinner and a West Village cocktail crawl AND she suggested Malatesta for dinner - small world indeed! I was super pumped now - two people I respect recommended this spot. I was ready for dinner! When we were seated, we were quickly brought a plate of sliced focaccia bread with olive oil and balsamic vinegar. Hey there carbs, get in my belly! The handwritten menus add a personal touch to the restaurant - both the regular and the daily menus are handwritten. Menus with a Special Touch! 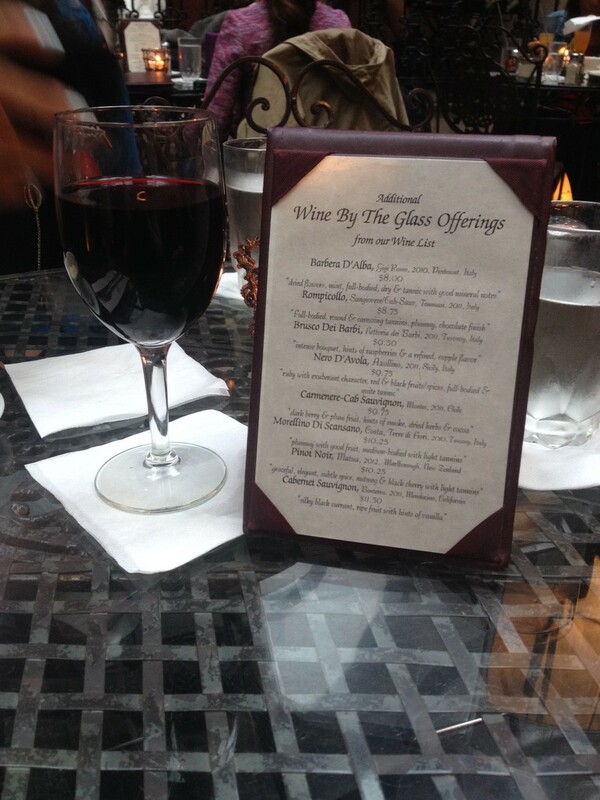 While we were looking at the menu, we decided to each order a glass of the house Sangiovese. It was light, fruity and delicious. We split two of the pasta dishes. One of the regular favorites: Homemade Spinach Gnocchi with Gorgonzola Sauce; and one of the specials: Artichoke Ravioli. The sauces for both pasta dishes were delicious - a perfect dipping vehicle for the bread. Both of the dishes were full of flavor and tasted incredibly different, even if they were both green! I'd recommend coming to this place before it gets super crowded - before 7:30pm for sure. It is a TINY restaurant and you sit fairly close to other diners. Either way, it is worth the trek over to the West side to check out this spot! Experience Mario Batali on a Budget! If you have seen a trend in my last couple of posts, I attempted to find joy during lunch breaks to survive the intensive class I had last week. Two of my close girl friends (Christine and Kate) and I went to Otto Enoteca Pizzeria (http://www.ottopizzeria.com/restaurant.cfm) for a relaxing lunch. We wanted to split a salad, pasta and pizza. After looking at the menu, we picked three crowd pleasers. I forgot the snap a photo of the salad. We chose the Otto Chopped Salad. It is super yummy and not too heavy. The dressing is light and tasty and the salad is chock-full of goodness (meat, cheese and veggies). For our pasta, we split the Spaghetti Alla Carbonara, made with pancetta, scallions, black pepper and egg. Very creamy and full of flavor! For our pizza, we chose the Margherita D.O.P made with tomato, bufala mozzarella and basil. This is a yummy pizza that isn't too heavy. It was a great choice to complement the pasta which was heavy (and delicious!). I was really happy with the mix of food that we got. I didn't want an entire pizza or salad or pasta. This was a wonderful way to sample a lot of different things. After grabbing drinks at Hudson Malone, I met up with Melissa for dinner in her neighborhood. She has a favorite spot near her apartment that serves up affordable Italian dishes and makes fresh pasta! Pepe Giallo (http://pepegiallo.com/) has a great vibe - very quaint and warm. We decided to order the house red (Montepulciano). The 1/2 carafe is $14 and the carafe is $23 (save $5 for double the wine). Which do you think we ordered? If you get a Carafe, make sure it is a FULL ONE! A better value! As we nibbled on the warm bread, served with olives and olive oil, we looked over the menu and sipped our wine. Melissa has been here many times, so she was full of super helpful tips and recommendations. We decided to split the Apple, Goat Cheese and Tomato Salad, served over Organic Greens ($8). This salad was super yummy and a decent portion size to split. I was torn between a couple of the pasta dishes. I wanted to get the Rigatoni with Salmon and Mushrooms in Cream Sauce ($13) but I wanted to try the homemade pasta. For an upcharge of $2, I changed the pasta to the homemade fettuccini. AWESOME CHOICE! The salmon was delicious (not fishy) and super tender. The sauce was creamy without being too heavy. I loved it. LOOK - You can actually see CHUNKS of Salmon! Quality! Melissa ordered the Fettuccini with Chicken and Mushrooms in Alfredo Sauce ($13). I tried a piece of chicken - delicious! I did prefer my dish more though. I will comment that the portion sizes are great, especially considering the reasonable prices, and the amount of protein in each dish was awesome as well! Great spot! I cannot wait to return! Sotto 13 for a Delicious Meal! Last Friday, Elspeth, a lovely lady from my block at Stern, organized an unlimited (I love the sound of that!) wine meal at Sotto 13 (http://sotto13.com/). This spot is known for its boozy brunch, which I still need to check out! For our dinner, we had a great selection of different tapas and pizzas. We had calamari, arancini balls, meatballs, shrimp scampi and two different pizzas (cheese and sausage). We also had a great selection of wines: different reds, whites and roses. I was too engaged in conversation with the other ladies in my block and sampling the different wines to document each part of the meal. Trust me, it was yummy. I will need to go back for the brunch. I snapped a photo of the group of ladies. Melissa and I were walking in Chelsea after our nail appointment the other day and we were in desperate need of an adult beverage. As we were walking, we caught a sign for a Happy Hour at a cute little Italian Spot: Pastai (http://www.pastainyc.com/). I'm always down for an affordable glass of wine. I've been dabbling more in red wines. I'm going to Napa again with a school group and I want to start developing a taste/appreciate for red wines. We each ordered a glass of a lovely Montepulciano. The wine is very jammy and easier to drink than many red wines I've had before. The spot has its own personalized wine glasses - really classy. I want to come back for food - the kitchen was opening up when we were there and the fresh pastas looked delicious. Last weekend, Meredith and I shared our last meal together at The Meatball Shop in Chelsea (http://www.themeatballshop.com/). I chose this location (there are multiple in the city) because it features the downstairs bar adorably called Underballs. I was heartbroken to see that the bar isn't open on Sundays! I chose to order the Spicy Pork meatballs with the Parmesan Cream Sauce. You get 4 meatballs with an order. I got a side of broccoli so I could dip it in the sauce instead of the foccacia bread that comes with it. Sad panda. I love love love this place. The cocktails are great too but I chose not to imbibe.